How does using visual aids support independence? Why is this strategy particularly helpful for ELLs? How could you use this strategy in your classroom? The visual aids that were incorporated throughout this “Walls That Talk” video were very insightful and thought-provoking. I think that the four sections of the wall were categorized nicely in terms of strategies and protocols, language structures, essential questions, and the word wall. The main wall section that I appreciated was the word wall because the teacher provided vocabulary enhancement, appropriate sentence structures, and even displayed various student work. The main goal of this “Walls That Talk” strategy was to evidently organize the classroom environment to surround itself with visual aids that would cater to the students and further develop their interest in their academics. 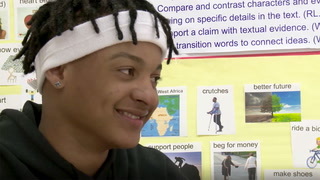 The essential questions were vividly shown on the board so that the students would be able to constantly refer back to them throughout the school year and see how their overall understandings of those questions have changed and how they have grown. My name is Letricia "Trish" Cesar and I am a 26 year veteran of special education. I have taught every grade level, inmates in a prison, a drug rehab, and a juvenille correctional facility. My passion is at risk kiddos. I want the students that aren't interested in school. I want the students most teachers don't want. I choose for my video "Wall that talk". I enjoyed the way the teacher used her wall space for visual aides for several of her students. I love her concept of using visual aides. Her wall space seemed to be cluttered with tons of information for special education kids, but her thought process was great using the idea. Most students are visual learners and I enjoyed her sharing her story. Speaker 1: One of the ways I support my students' independence is by organizing my classroom physical space with appropriate visual aids. When you walk into my classroom, one of the things you notice, there are a lot of visuals and words displayed on the wall. All of this is very purposeful. I would like my students to use these materials as a resource. Speaker 1: Who has more power? Remember the word power? Speaker 1: Students in my class are newcomers. They come from different countries, from South America and Central America. Speaker 1: Print-rich environment is extremely important for these students. You need to have things that you're using in the class available of them. Speaker 1: Who impacted the lives of others the most? Speaker 1: Not only that, but you have to be able to refer to them throughout the unit. Speaker 2: And to read and writing about the move. Speaker 1: So I have several sections in my classroom. I have a section for strategies or protocols, where I have my Read, Retell, Respond poster. See, Think, Wonder protocol, and also the sentence starters that they need to use these protocols, but then I also have this section on the board that is called language structure. Every lesson I place the structure and the pattern that they're working with in the same location on the board, so my students know that I expect them to use it while I ask them questions. Speaker 1: So here, can you do another one like this? Speaker 2: [inaudible 00:01:46] is good at going to school. Speaker 1: I also have my social questions on the board that are translated in Spanish that I would like to be constantly visible, because we're referring to them almost every class, and I want them to think about them throughout the unit. Speaker 1: And then there's a word rule that also has two parts. First, the vocabulary that we are working with that students can refer to themselves and that I refer to as I ask them questions as we work. Speaker 1: And the sentence structures that they need. In addition, there is a section in my classroom where I display student work. It's really good for students to see their work on the wall. It empowers them, it gives them this feeling of success, and they're very proud of it. Speaker 1: All the tools that I use in my classroom are aimed to make my students more independent. At the same time, it's also a way to differentiate, so the sentence structures are translated in Spanish. There's also visuals, pictures, that help students memorize the vocabulary, and at the same time like now, they can already produce sentences, but I want them to use more academic vocabulary, so I always point to the structure. I point to the vocabulary wall. Can you please use the key vocabulary? To enforce it, to raise my expectations.